“The leading home decoration and design show is coming to Miami Beach” Maison&Objet opens the “Gateway to the Americas” Maison&Objet, the world’s leading showcase for design and décor professionals, held twice a year in Paris, continues its worldwide expansion. In the electric atmosphere of the premiere of Maison&Objet Asia, held in Singapore March 10-13, 2013, Maison&Objet will announce another milestone: the new Maison&Objet Americas show, to be launched in Miami Beach on May 12-15, 2015. This brand-new event is designed to provide the sector’s players with a new way of doing business and boosting their profile, as well as bringing together, for the very first time, design and interior professionals from North and Latin America. A city ideally poised at the crossroads of the Americas The City of Miami Beach, known as the “Gateway to the Americas,” quickly became the indisputable choice as the setting for a new show, having the power to draw great numbers of qualified visitors from North and Latin America. This thriving metropolis – a financial, economic and cultural center of global stature – has a geographical location and history that position it as a natural bridge between the Americas. Renowned for its Art Déco District, home to the largest collection of Art Déco architecture in the world, in recent years Miami Beach has undergone major urban regeneration as the city booms, especially from a cultural standpoint, and the Art Basel Miami modern art show provides one of the best examples of this flourishing cultural scene. 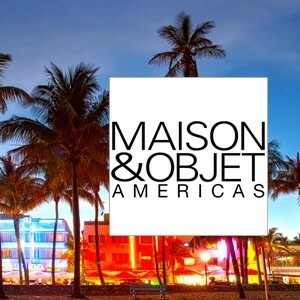 This year’s show is also the moment the MAISON&OBJET organizers have chosen to officially launch MAISON&OBJET AMERICAS, to be held at the Miami Beach Convention Center. The announcement has been made at a press conference on Thursday 5 December 2013, attended by Ed Tobin, the Miami Beach Commissioner. An extraordinary event born of the Maison&Objet DNA Over more than 15 years, Maison&Objet has established its reputation as a peerless semiannual event capturing a broad vision of lifestyle, creation, and design. The show, expressing excellence and innovation in tangible and intangible ways, has expanded while remaining true to the original concept: bringing together the most talented home interior professionals. It has thus become a platform for new trends; every show is trusted by over 3,000 exhibitors and an ever-increasing number of international visitors (up 50% in September 2013). The Maison&Objet Americas concept will recreate and intensify the singular, creative, sophisticated Maison&Objet atmosphere. The 250 stringently selected exhibitors will exemplify the multidisciplinary perspective of Maison&Objet as they present, under a single banner, the very best in interior design with an unprecedented close look at the brands, designers, and artists from throughout the two Americas. Furthermore, the event’s new American home in the downtown South Beach district imbues the show with tremendous added value, providing a dynamic, friendly working environment and generating the ideal climate for doing business.This new, upscale showcase – created for interior designers and decorators, hoteliers, restaurant owners, retailers, investors, and journalists – is steeped in the unmatched savoir-faire of Maison&Objet. It also enjoys the active support of Reed Americas, the top conference and trade show organizer in the US and Latin America. Maison&Objet Americas 2015 Designer of the Year As is done at Maison&Objet events in Paris, Maison&Objet Americas will be presenting a Designer of the Year award in Miami Beach. The Maison&Objet Americas 2015 Designer of the Year will be selected from among top American designers who have distinguished themselves in their design fields. The winner will be invited to design a dimension of the Miami Beach show and serve as an ambassador for Maison&Objet Americas. Emerging Talents (Rising Talents of the Americas) Up-and-coming talents from the Americas will also be in the spotlight at Miami Beach in Americas Rising Talents, a showcase of six of the region’s hottest new creators. Interior Design & Lifestyle Summit Maison&Objet Americas will also be the site of an important conference, the Interior Design & Lifestyle Summit. This series of conferences will offer visitors an opportunity to decipher current and future trends and see what the most prestigious designers are working on.